Smoked salmon is a low fat rich source of protein that contains vitamin D, B vitamins like vitamin B12 and vitamin B6, niacin, and pantothenic acid. It is said to go well with avocadoes and condiments such as cream cheese. It is commonly used in pasta and sandwiches as well as eaten as is raw. 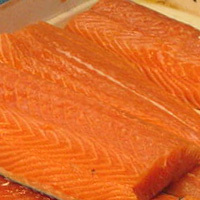 The calories in Smoked Salmon per 10g(1slice) is 16 calories. Smoked Salmon is calculated to be 161Cal per 100 grams making 80Cal equivalent to 49.69g with 2.57g of mostly protein、0.55g of fat、0.01g of carbohydrates in 10g while being rich in vitamins and minerals such as Vitamin D and Vitamin B12.